Maggie and Ryan have started Tae Kwon Do. 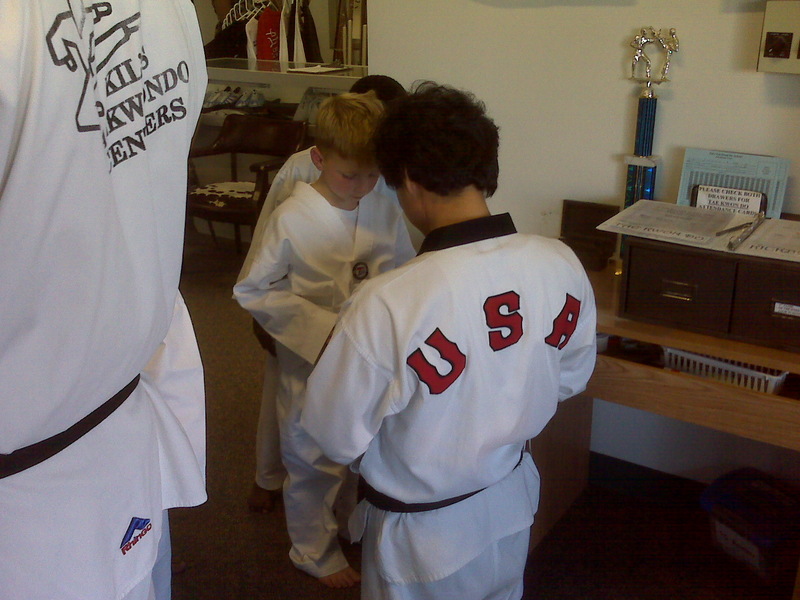 The above photo is Ryan getting a bit of yellow tape on his belt. He’s quite into this. Maggie is liking it too though not as excited as Ryan. It’s good for them and since we homeschool, this will be their Physical Education this year. Galina was here. I love her. It was 2 weeks ago and I took like 2 pictures. Whenever she is here I work hard. My Russian Support spindle spinning had improved dramatically. it only took me 5 years and 2 days to get to the point I am right now. We also had 2 days of working on Orenburg Warm Shawl construction. The construction of these shawls is very different than the Orenburg Gossamer shawls and I have been wanting this class for years. Finally! I belong to a lace knitting group, as many of you know. The members include Faina Letoutchaia and Sharon Winsauer. So there is plenty of help available. A few of us will be working on designing our own warm shawl. If there are any people in the Lansing area who would like to join the group and work on this project please contact me and I will tell you all about when and where we meet. In the mean time we have some new things in the shop. Black Bunny Fibers is owned by Carol Sulcoski. I originally came upon her work when I was gifted some Wensleydale dyed by her. I spun it up and knitted the Indian Summer Shrug from it. I almost immediately began bugging her to let me put some in my shop. Finally she got sick of hearing about it and gave in. The colors are gorgeous and she does plenty of not the usual fibers. So if you are looking to try something new and you are tired of white then Black Bunny might be for you. Also, this week we got fibers from Australia. Pear Tree is the company. I picked this up at TNNA. Just walked by and stuck my hand out and blammo! This is merino wool that is so fine it feels like cashmere. I’m not lying. And the colors….the colors….I really want to keep some of this. This week i will be working more on spinning for the Spin Along / Knit along. The progress is slow. I will also be combing and spinning some Wensleydale and continuing to warp that loom that has been feeling neglected in the corner. The beginning rigid heddle weaving class went very well. Almost everyone went home with a finished scarf that they liked and they are ready to tackle their next projects. Weaving is growing right now. Is it because all the spinners can’t knit their yarn fast enough? For most I have a sketchy idea of what will be taught and pricing will be coming. But here’s the list. If you’d like to sign up for any future classes we need a $50 nonrefundable deposit to hold it and then we will come back at an appropriate time to either collect the rest or another deposit. So here goes. Still 6 spots available – see classes page for details. 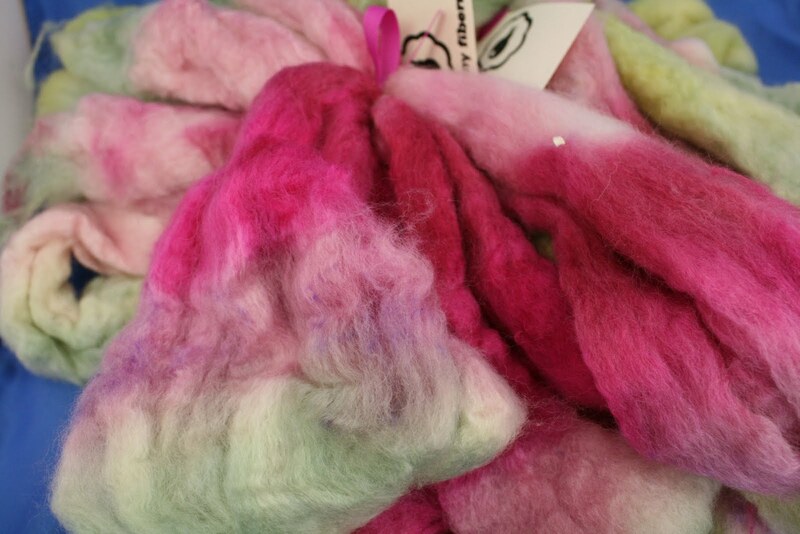 February 25-27 Velma Root of Colorbomb Creations, Spinning colorful yarns…check out her website. August 12-14 Deb Menz, Dyer’s Notebook – 3 full days of hard work. That’s all I have at this time but the year is full! If you want to reserve a spot, email or call the shop. Sigh! I wish you weren't across the state from me!